Can’t complain about the weather too much. It’s been pretty nice the last few days and I hear the week is to be even better. We did have some pretty cold, frosty mornings, but then it warmed up well. Most all the gardens are done and the flower beds pretty dead looking. IHM Parish is having their annual Fall Bazaar on Sunday, the 8th at St. Francis Hall in Mildred. This will be from Noon to 5 p.m. with all kinds of activities going on. If you get a chance, check it out. It’s really a good time and a nice way to support the Church. We had a really good turn out this year for the Civic Association Halloween party, held on Saturday, at the Pavilion. Thanks to Chairman, Kim (Neufer) Hall, who did a good job for her first time. Thanks to the judges, Gloria Weisbrod and Rhonda Stasiak, who had their job cut out for them in picking out the winners. There were some awesome costumes this year. Prizes were awarded to the following: 0-3 age group: Pretty -Khloie Bahr; Ugly – Owen O’Conner; Funny – Henry Ritinski. 4-7 age group: Pretty – Kaeleigh McDonald; Ugly – Gaige Burke; Funny – Weston Higley. 8 -11 age group: Pretty – Ember Higley; Ugly – Connor Partington; Funny – Luke Hontz. 12 & Up age group: Pretty – Erica Brigham; Ugly – Kyler Burke; Funny – Layton Shen. Everyone enjoyed refreshments. After the party, Brian McGuire took kids, and parents, trick or treating through town on his hay wagon, pulled by his truck. That was fun for all and thanks to him for doing that. Thanks to all who donated “goodies” and helped with the party. Thank you to those who had their porch light on and treated the kids when they stopped by. Looking forward to next year. St. Vladimir’s Church has pierogies for sale. To order yours, call 570-928-1099. New Albany Volunteer Fire Company presents their play, “A Fractured Christmas Carol” on Saturday and Sunday, November 13 and 14 and 20 and 21. This will be held at the Social Hall and will be at 7:30 p.m. It’s well worth it to see and support the Fire Company. If you’d like to donate to the Cold Spring up-grade project, please send to Lopez Civic Association, P.O. 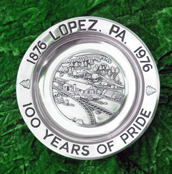 Box 100, Lopez, PA 18628 and mark the envelope “Cold Spring”. Next Civic meeting will be Tuesday, November 17, 6 p.m. at the Township Building. Happy Birthday wishes to Aiden Sperry, 13th; and Wilda (Wood) Paul, 14th. Have a super day. B’s gang sends Happy Birthday wishes to their buddy, Brian McGuire as he celebrates on the 11th. Have a great day. Dad, Mom, Jr. and Tyler also say HAPPY BIRTHDAY!!! Happy Anniversary to V Rev Andrew and Georgette Matychak as they celebrate on the 10th. Congratulations and have a nice day. Ted and Mary Lowden are back from NJ to their home on Maple Terrace. We’ve seen a lot of turkeys around in the fields, but not too many deer. Guess that’s the news for this time. Enjoy your week. Hope the weatherman is right when he said we may hit close to 70; supposed to be our “Indian” summer. I’ll take it and more. Have news call me at 570-928-9238; mail me; see me; or e-mail me at uvbob@epix.net. I’ll get it in for you. I’ll be here next time and thanks for reading. Halloweeners and the DJ B hay ride around town collecting goodies.